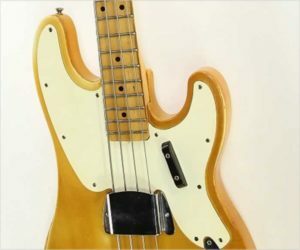 This instrument is all original, used as intended, 1970 model Fender Telecaster Bass in translucent blonde finish – the same kind of finish as on early Telecasters. Yes, this was white when new. This particular bass was clearly used for many years in smoky environments, before second hand smoke legislation cleaned the air in bars and clubs across the country. Just wanted to let you know that my Banjo arrived today. I am glad I paid the extra and got the Artisan. It is beautiful and the sound is awesome like I knew it would be. Thanks again and if i find anyone in need of a banjo I will send them your way for sure.